* Lessons only suitable from Second Trimester onwards. Prenatal swimming classes or prenatal aqua aerobics when compared to prenatal yoga as an exercise for health, might seem like a taboo for most women during pregnancy. 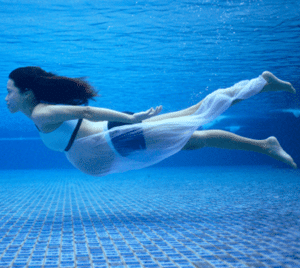 Despite the presence of controversies and chlorine, pregnancy swimming have countless benefits similar to pre natal yoga that help women to continue their healthy lifestyle without letting pregnancy hinder their active regimen. Although prenatal exercise does help to reduce water retention and swelling but swimming during pregnant first trimester and near birth date are not encouraged. 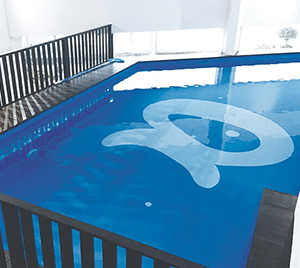 Unlike the usual swimming lessons for fitness training, prenatal swimming classes in Singapore conducted by Happy Fish Swim School offer a unique set of programs to cater to the delicate condition of pregnant women. The prenatal swimming lessons are tailormade for swimming in pregnancy second trimester at indoor heated mineral swimming pool to fit the needs of soon-to-be mothers without causing serious harm or pregnancy risks to their condition. New class is conducted in a small group of at least 2 students where they get to swim in a warm, comfortable and safe environment. Mobility is an issue especially when it comes to pregnancy. Movement is limited and a pregnant woman can often find herself slowing down when it comes to performing activities of daily living. Due to belly’s growing size, back and limb pain is an issue. Aching joints and muscles is very common as the body’s normal form and structure adjusts to the baby’s growing size inside the womb. Pregnancy causes the body to gain more weight. Due to hormonal changes, pregnant women are prone to experiencing depression and irritability. Pregnancy has a way of making a woman feel sleepy and of low energy throughout the day. Pregnant women tend to feel a sense of low self-esteem due to the presence of physical changes on the body during the prenatal period. 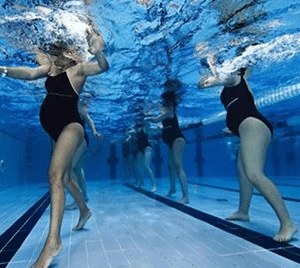 Why Learn Swimming During Pregnancy? Swimming is a form of aqua aerobics exercise which does not only strengthens the muscles, but also improves the body’s endurance and stamina. In fact, prenatal swimming increases the ability of the cardiovascular system to function optimally. Swimming during pregnancy not only affects the body on a physical level, but also improves the holistic condition of the mother. Catering to the physical, emotional and psychological needs of women, benefits of joining pregnancy swimming classes in Singapore help to create a balance of wellness and positivity on a person. Group classes are normally kept to a minimum number of students to ensure that proper learning, attention and care are given to the mothers. The lessons and schedule are highly laid out with great medical consideration to secure a healthy pregnancy on women along with the presence of constant muscle and body workout movements common during swimming exercises. Overall, pregnancy swimming classes enable women to empower themselves and develop a healthy lifestyle that is not limited to their current condition. Prenatal swimming classes come with plenty of advantages. Generally, exercise is healthy for a pregnant mother and here are some of the benefits that can be gained from swimming lessons. Helps reduce limb and joint pain. Swimming takes away the pressure and strain on the back, thereby relieving the body from tension and discomfort. Reduce water retention and swelling. Promotes healthy movement and exercise. Movements are more fluid and natural as the body flows in tune with the motion of water. Improves endurance especially during childbirth. Swimming increases the body’s stamina. Hence, pregnant women can benefit from gaining better strength in experiencing labor pains and pushing the baby outside of the womb. Lowers the risk of experiencing pregnancy-related conditions. Gestational diabetes is a common issue especially as a mother increases her appetite to feed the baby inside her womb. Exercise lowers the chances of going through this kind of medical condition. Reduces the odds of being overweight all throughout pregnancy. Swimming during pregnancy keeps the body lean and prevents the occurrence of gaining too much weight. Also, women who exercise during pregnancy have better chances of going back to their pre-pregnant body than those who don’t engage in any form of physical workout. Help a woman achieve confidence and a higher sense of self-esteem. Improve the mood of a pregnant woman. Hence, she will less likely experience periods of depression and mood swings. Prenatal swimming classes in Singapore are conducted at Indoor Heated Swimming Pool to fulfill the growing needs of women who don’t let pregnancy get in the way for them to achieve an optimal healthy lifestyle. Usage of chlorine in the pool is minimized during maintenance cleaning which NASA-patented ionisation technology, MineralPure system and enhanced Ozone (O3) are used to cleanse, disinfect the water instead. With the pool temperature being maintained at 30-32 celsius, now all mother-to-be can get the full advantage of the holistic benefits of swimming in a warm and safe mineral pool. *Group lessons of at least 2 students to start. How many lessons for 1 class? There will be 4 prenatal lessons conducted for each registration. How long is each swimming session? The duration for swimming lesson is 60 minutes per session. Is there makeup lesson if cannot attend? For lessons that are unused can be replaced with adult or baby swimming lessons. What is the frequency or how is the swimming class schedule like? The swimming classes are fixed for 12 weeks consecutively excluding public holidays. Is prenatal swimming suitable for me? Prenatal swimming classes are only suitable for mothers from second trimester onwards. Please consult your obstetrician or gynecologist before registering to join the class.